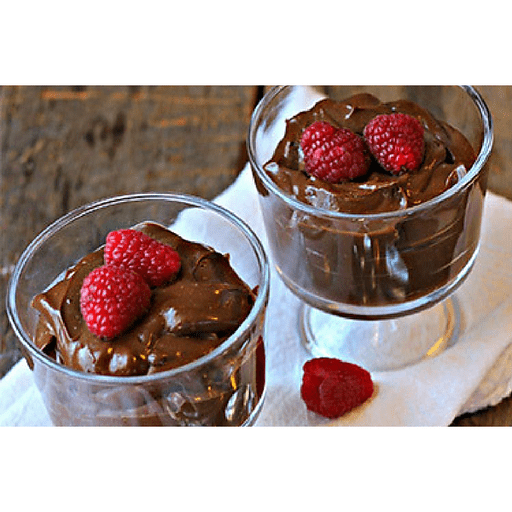 This decadent chocolate pudding is made with creamy avocados instead of heavy cream. 1. Melt dark chocolate chips in a double boiler or in the microwave, until melted, stirring every 30 seconds. Allow to cool 1-2 minutes. 1. Put the dark chocolate, chocolate milk, avocados, maple syrup, vanilla extract, cinnamon and salt into a blender and puree on high for 30 to 60 seconds, until smooth and creamy. Scrape down the sides with a spatula. 1. Transfer the pudding to glasses, ramekins or jars and chill in the fridge for at least 3 hours. 1. To serve, top each pudding with fresh raspberries. Calories 240, Total Fat 13g (Saturated 5g, Trans 0g), Cholesterol 0mg, Sodium 60mg, Total Carbohydrate 33g (Dietary Fiber 5g, Sugars 21g), Protein 1g, Vitamin A 2%, Vitamin C 10%, Calcium 6%, Iron 2% *Nutritional values are an approximation. Actual nutritional values may vary due to preparation techniques, variations related to suppliers, regional and seasonal differences, or rounding.